This week I'm going to talk about pipe and drape accessories. Going back to last week's discussion about being in compliance with local fire codes, I found out that you can get iron-on labels for your drapes that identify them as being flame retardant. If you have these, you won't have to worry about losing paperwork. The large part of the hook fits over the horizontal pipes at the top of your booth. The small part of the hook is for attaching your sign or banner (it slips into the holes). If you don't want your sign at the top of your booth, you can use fishing line or chains to lower it. And if you love to stay organized, you can purchase carry bags for the different components of your booth. Nothing like having a skinny 8 ft. long carry bag! 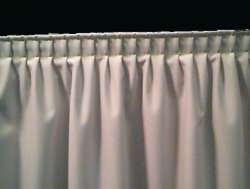 If you have anything to add to the pipe and drape discussion, I’d love to hear about it! Share your experiences with the B.E.S.T. team by sending me an Email and I'll include them in a follow-up post. Be sure to include your name and a link to your Etsy shop. 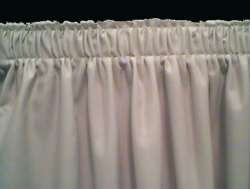 Nice curtain pleat's and so many..thank's for sharing. 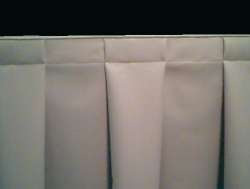 HI, How did you add lights to your pipe and drape booth. I was accepted to my first fancy show and need some ideas. I really like the pipe and drape instead of panels but cant figure out lights.